Nov 10, 2014 - Sgt. 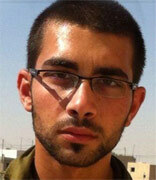 Almog Shilony, 20, of Modi'in was stabbed to death by a Palestinian terrorist at Tel Aviv's HaHagana train station. Sgt. Almog Shiloni, returning from leave to his army base, was critically wounded after being stabbed multiple times in a terror attack at Tel Aviv’s Hahagana train station on Monday afternoon after a struggle with a Palestinian who attempted to grab his weapon. He was evacuated in critical condition to the Tel HaShomer Sheba Medical Center, where he later died of multiple wounds to his stomach and chest. Sergeant Shilony was posthumously promoted to the rank of Staff Sergeant. Religiously observant, Shilony served in a company of Nahal Haredi, an army framework designed to allow religious Israelis to serve in the IDF in an atmosphere conducive to their religious convictions. On the eve of his recruitment to the army, he said, "I always wanted to be a fighter. I prepared for my recruitment by working out, running." Shilony completed the first platoon commander course of the Netzah Yehuda program of the Nahal Haredi. Rabbi Dov Lifshitz described him as a true believer who was highly respected by the soldiers who served under him. Sahar, Almog's twin brother, related, "Almog was a strong kid, always smiling. We celebrated our 20th birthday a month ago in a Jerusalem pub. We were sitting with our girlfriends, we laughed. I told him I hoped everything he wanted would come true. He wanted to marry Noy, his girlfriend for the last two and a half years. There are no words for how I feel right now. I can't comprehend it." St.-Sgt. Almog Shilony was buried in the Mount Herzl military cemetery in Jerusalem. He is survived by his parents, an older sister, twin brother Sahar, and two younger brothers.